What is Text 4 Travel? Text 4 Travel is designed specifically for the Travel industry to provide you, the Travel Agent, the ability to notify your customers of details they want to hear. It might be news, special offers, ticket collection or the unfortunate scenario that flights have been cancelled. Sending a text message is a quick, simple, and convenient way to send either a single message to one customer, to inform them that their tickets are ready for collection or to send multiple text messages to your customer base to inform them of special offers. There is no limit to how many you can send. 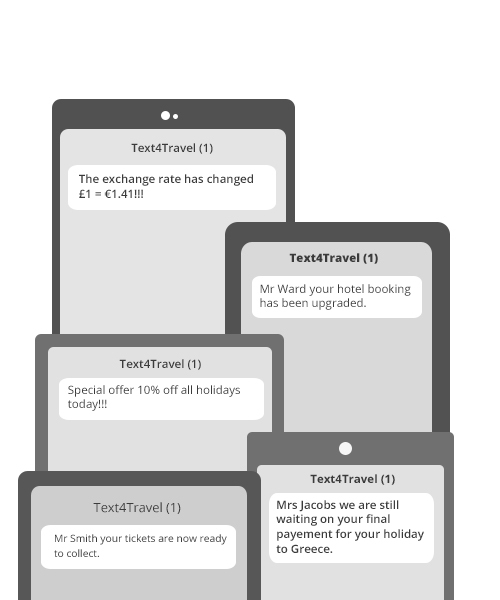 With Text 4 Travel you can create your own personalised groups to send the same message to all group members. You can also create standard template text messages to save you having to write the same message every time. By being able to preview your messages on screen, as well as sending a text message to your own phone you can make sure your customers are receiving what you want them to receive. Why use Text 4 Travel? Use Text 4 Travel to keep your customers informed. It is designed to be easy to use so you can concentrate your time on providing great customer service. You don't have to worry about being technical or not having time to invest in setting up new campaigns. You simply login, and then in a few clicks you have sent a text message to you customer(s). Why is sending a text message better than a phone call or an email? To be honest it might not be for everyone. Making a phone call to a customer has got to be the most personal approach to making contact and your customer might not even have a mobile phone. But what if you phone and they are not available, do you leave a voicemail message.... do you try again at a different time...do you send an email. These days the majority of calls made to customers are made to a mobile phone. Therefore it is possible to send them a text message. Most mobile operators charge you to listen to voicemail messages. So if you call a customer to give them some information the changes are it will cost them to listen to your message. There are benefits to your and to your customers in sending a text message. Sending a text message is a quick, unobtrusive method to contact your customers. It won't cost them anything to receive it, it provides a record of correspondence and provides immediate delivery*. *where customer has network coverage. Text 4 Travel is for the Travel Industry to update their customers with News, Special Offers and ticket information in a convenient and efficient manner.